Fifty participants will participate in the My House Fitness 6-Week challenge to Better Health and Fitness contest. My House Fitness locations have teamed up with 31 Gifts, Origami Owl and several other local businesses to host their Annual Beach Body Fitness Transformation Challenge. Over 50 participants from across Central Florida will take part in a contest to cut the most pounds of fat from their bodies. The most drastic individual transformation will win $500 CASH. My House Fitness trainers at all locations will combine intense metabolic training with targeted improvements in nutrition to challenge participants to lose as much fat as they can in a healthful manner. Jenny says, “I’m all about people changing their lives for the better." Unfortunately, in the modern age there is an overload of information both good and bad available, so when people try to figure it out on their own, they are paralyzed by so many choices and fail even to take the first step. “We are making it as easy and transparent as possible to take that first step. We take out all the guesswork,” she added. The contestants will go through a rigorous and well-researched 6-week program consisting of metabolic training up to three days per week. Over the past 4 years at My House Fitness, this challenging training regimen has proven its value in creating permanent change. Over the next 6 weeks, My House Fitness will be chronicling their journeys at our website. Pictures, video, and weekly updates can be found on the My House Fitness Official Blog. 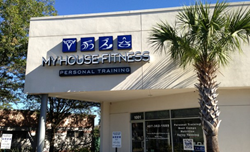 Orlando based My House Fitness, provides clients with personal unique training experience. They are dedicated to helping each client achieve his or her health and fitness goals. My House Fitness owns two corporate locations and has one franchise location. For additional information on franchising opportunities visit our Franchise Website.